A Paso Robles man is dead following a head-on collision that occurred on Highway 229 east of Santa Margarita shortly after 7 a.m. on Tuesday. Darin Moore, 48, was rounding a corner on his motorcycle when he swerved into the other lane and struck the left front of a Mazda MX-6. Moore then called 911 to report the accident. An Atascadero High School student was the first on the scene and called a doctor who lives nearby to assist. The neighbor arrived within minutes and began providing care. She used a stiletto to remove the injured man’s clothing and discovered Moore was wearing a bullet-proof vest. Moore was transported to Sierra Vista Regional Medical Center and then air lifted to Cottage Hospital in Santa Barbara where he later died from his injuries. Im a friend of the family and I ask that you PLEASE, PLEASE WATCH WHAT YOU SAY. Out of respect for the family and friends that may see this. It is a very hard time right now. They are a GREAT FAMILY, and I would hate for any of them to see any of the negativity on here that some of you have laid out for the public to read. If the section of Hwy 229 that where this occurred is the end just off Hwy 58, it is a very narrow road — almost too narrow for 2 cars in places — and very winding too. Let the police do the speculating on who is to blame here. It could be either party or both and it wouldn’t take a big error in judgment for it to happen. 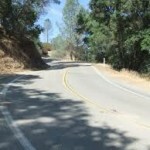 Years ago a friend of mine was descending that road on his bicycle and misjudged a turn. He paid for that misjudgment with a couple of months in the hospital and several more before he could ride his bike again. His last name was also Moore — I think that road may have it in for people sharing that name. Yeah, the Italian stiletto was the chosen one when I was in school in LA, even though I wasn’t Italian. This was an unfortunate accident, and lest we forget, the driver of the Mazda will live with this incident for his life as well, along with the grieving family and friends of Mr. Moore. Relating to motorcycle accidents, just a query, how many have experienced motorcyclists taking the dangerous position on highway 101, swerving closely, in and out between the automobiles at 65mph in passing them? Some barely making it through the small separations between the cars at times. They not only endanger themselves, but you as well. Innately, would you feel as bad as for Darin Moore if the swerving motorcyclist mentioned above was later rolled into a little ball by a semi-truck further up the road because they finally cut it too close, and then died because of their miscalculation? Barring family and relations, was justice served for this person for endangering your life and being stupid? Years and years ago a guy on a bike ran into the back of my pick-up truck pushing the bed up about an inch. He died after hitting the truck then flying about twenty feet in the air. No blood just no pulse. He wasn’t on alcohol, or drugs. I will never forget the look on his face when he hit me. Cop said he was clockd at 95mph about a block before he hit me. This was one of those bikes that, (let the good times roll”.) Very heavy. Every July third we think about this terrible accident about 3 or 4 decades ago. We stay home on the 4th of July every year. We remember every detail. We don’t talk much about it but we both know why we are staying home on the 4th. My hearfelt sympathies for this loss of life. His family and friends are no doubt going thru difficult times. Blessings to all who knew him and mourn their loss. RIP Mr. Moore. Condolences to his family and friends. Sooner or later, we all have it coming. Peace and condolences to Darren’s family. Let us show a little respect here! We all have to be aware that our country roads are busier now as more people build out into the country and we have the solar plants with workers and commerical vehicles going back and forth. This is like a scene in a movie. A guy’s driving a motorcycle on a road leading out of Atascadero (destination: the boonies) and pastes himself onto the front end of an on-coming car. The motorcycle rider is the first one to report the accident. A local high-school kid calls a local female doctor, who happened to live nearby. The doctor used a stiletto heel to remove the clothing of a guy (really, how cool is THAT?! ), at which time she finds he is wearing a bullet-proof vest. The motorcycle rider is so tough he makes it through being airlifted to two hospitals, before he dies. Aside from the part where the guy dies, which is really sad, this is James Bond stuff. Especially the stiletto heel part–which is the coolest thing I’ve ever heard of a doctor doing. My goodness, how sensitive of you, Mary; a man died fergawdsake. So, the biker “swerved into” the car, huh? Don’t suppose the car driver said that, huh? Maybe it was the same car that was driving down the middle of the road on 229 that I had to swerve around to avoid on my motorcycle Sunday. Seems every bumpkin on our rural roads thinks his half is in the middle. And if they are in their dually pulling a stock trailer, well, buddy, you can just take the shoulder, ’cause they aren’t moving out of the middle of the road for a damn biker, you can just die for all they seem to care. Your detachment and complete lack of compassion are shocking. Shame on you! Everyone deals with death their own way. If you feel your way is better than mine, that is your problem. Everyone is born with the weight of death upon their shoulders . Death is the fulfillment of life, nothing more or less. I am happy to be speaking about it, the imposition of silence is evil . But to the point of who was over the center line, it is very common for motorcyclists to overshoot the apex of a turn and be on the wrong side of the line when they exit the turn. I don’t think existentialism has much to do with it, zaphod. Looks more like a physics problem. I pray for the family of Mr. Moore, that they may have peace in their time of grief. If that is the way you deal with it, fine. But do it privately, not on a public forum. What is wrong with you lady “pastes himself onto the front end” this is a person you are talking about not an object, he was a father husband son brother uncle and friend to many!!!! My god have some respect!!! I knew him and his family what if someone posted this of one of your relatives or friends not very respectiful!!!! RIP Darrin!!! Um!!! Mary Malone,,,,,, How OLD are you????? You dont post thing’s like this on a public forum. It’s not “cool James Bond stuff “. His kids go to my daughters school and i see his wife daily and to see how torn up my friend and her family is BREAKS MY HEART, I couldnt imagine losing my husband. And to see how it has effected my daughter that her friends are so sad that their DAD is gone. He didnt drive around that corner thinking “let see what happens if I cross this line going around this corner today!” And the bullet proof vest is for work, get a clue!!!!! He drove that road to work and home every week!!!! People like you should’nt own computers, you have no common sense and obviously NO SENSITIVITY! You need to keep your mouth shut and stay off here!!! !